Marijuana milkshakes are ideal for sunny days. They are also far easier to make than some of the more common dough based recipes where you have to make a mixture and wait for the recipe to cook. 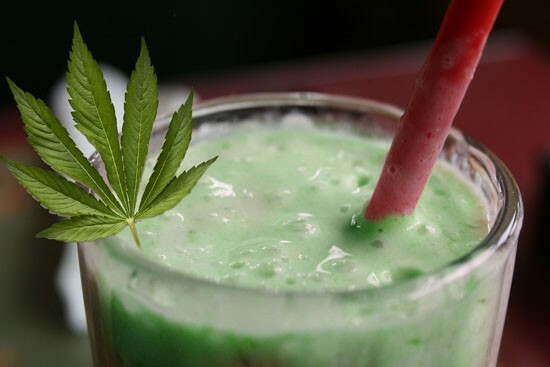 A marijuana milkshake is easy to make if you have marijuana milk at hand. Milk is particularly suitable for marijuana edibles because THC dissolves in fat. Due to this it is always better to use whole milk as opposed to low fat milk, however you can use vegan alternatives such as almond milk. This recipe makes use of cannabis butter. You can make your own or purchase this online from a reputable vendor. You can make your own cannabis butter but this is an additional step that takes more effort than making a marijuana milkshake, which simply involves putting everything in a blender and blending it all together. The best thing to learn how to make aside from cannabis butter is probably cannabis milk. You can use cannabis milk for pancakes, French toast, for your tea, milkshakes, even cereal. You can use cannabis milk anywhere you would normally use milk, and because THC and the fat in milk go well together, it is possibly one of the best THC combinations to learn. 1 tablespoon of Cocoa powder. Marijuana milkshakes are very easy to make. Simply combine the milk, cocoa powder, ice cream,fruit and ice cubes in a blender. Add the cannabis butter, as much as you deem necessary. Blend for about 30 seconds until you have a smooth milkshake. That is really all there is too it. It can take up to 2 hours to feel the effects, but usually you will feel the onset before this.